An interpretive sculpture illustrates the history of Japantown, an historic neighborhood in San Francisco. 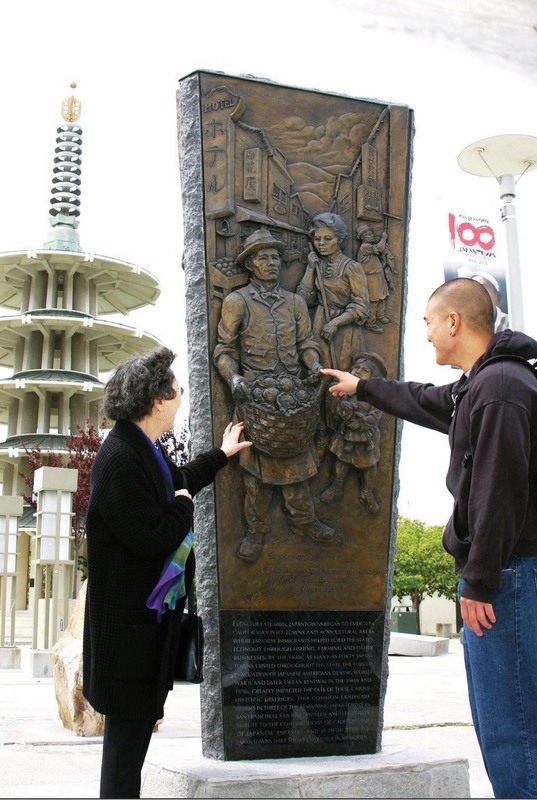 The Japantown History Walk takes visitors on a self-guided tour. Japantown (Nihonmachi) (population 7,845), located in San Francisco, California, is the oldest and largest Japanese community in the country. Japantown dates back to 1906, when the Great Earthquake and Fire devastated Japanese enclaves in Chinatown and South of Market, and the Japanese community began to move to the Western Addition area of San Francisco. In 1907, "picture brides" begin arriving, families were established, and the second generation of Japanese Americans, or Nisei, was born. During World War II, the entire Japanese community of San Francisco, both citizens and foreign-born, were forced from their homes and relocated to internment camps. Released in 1945, they slowly begin to return to the West Coast. In 1948, 27 blocks of the Western Addition area, including much of Japantown, were selected as one of the first large-scale urban renewal projects in the nation. A large number of residences and businesses in the neighborhood were taken by the government through the use of eminent domain. By 1960, about half of the core of Japantown was razed, displacing at least 1,500 residents and more than 60 small Japanese American businesses. Today, Japantown offers tourists many opportunities for shopping, eating, and entertainment, as well as a look at the area’s history. The Japantown History Walk takes visitors on a self-guided tour of about 10 city blocks. Attractions include the Japantown Peace Pagoda, a five-tiered structure that lies in the center of the Japantown Peace Plaza. The pagoda was designed by world-renowned Tokyo architect Yoshiro Taniguchi and donated to Japantown in 1968 by its sister city, Osaka. Cottage Row, a historic district, is an “English Mews” type walkway with six Victorian homes. Each year Japantown hosts the Northern California Cherry Blossom Festival for two weekends in April. The event features traditional Japanese cuisine and cooking demonstrations, a Japanese traditional arts and crafts fair, and a children's village, as well as performances by Japanese classical and folk dancers, martial artists, taiko drummers and others. In August, the Nihonmachi Street Fair celebrates the diverse Asian and Pacific American communities in the Bay Area.